Among 40 Kansas pools improved or constructed by the Works Progress Administration (WPA) between 1935-1939, Garden City engineer Charles W. Suit designed the Fowler Swimming Pool. A reinforced concrete oval structure, it measures 90 feet north to south and 120 feet east to west. It features a shallow ring that encircles the deeper diving area, which is marked by a reinforced concrete diving platform rising above the water from the pool floor. 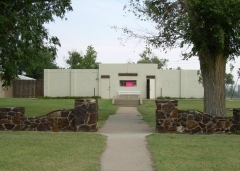 The one-story bathhouse is a simple reinforced concrete building with a central office flanked by dressing rooms on each side. There is a non-historic restroom building on the property. 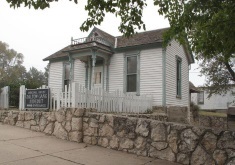 The property is nominated as part of the "New Deal-era Resources of Kansas" Multiple Property Submission for its associations with the WPA.